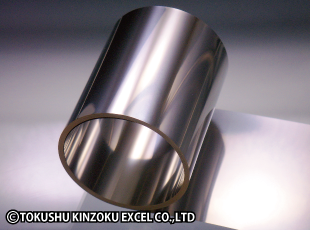 Resistance Alloys (Electric resistance & heating alloys) | TOKUSHU KINZOKU EXCEL CO.,LTD. The precision of thickness affects the precision of resistance in resistance alloys. We guarantee a high degree of thickness precision by using different rolling mills for different purposes. What's more, we are also able to adjust conductor resistance values by utilizing our advanced thickness control capabilities. What are electrical resistance alloys? While all metals conduct electricity, the ease with which electricity flows through a particular metal (electrical conductivity) is affected by chemical composition and other factors. Electrical resistance alloys are alloys for which the composition has been adjusted so as to impede the flow of electricity. High grade of resistance alloy with high resistance; low temperature coefficient of resistance; and good heat and corrosion resistance. Has poor brazeability and solderability. Highest grade of resistance alloy with high resistance. Has low temperature coefficient of resistance, and good heat and corrosion resistance. Resistance alloy with medium resistance properties. Has comparatively low temperature coefficient of resistance, and good workability and weldability. Resistance alloy with medium resistance properties and comparatively low temperature coefficient of resistance. Has poor corrosion and oxidation resistance, but good workability and weldability. Resistance alloy with low resistance properties. Suited to use in high-current sensing resistors, and has good workability and weldability. *1 Registered trademark of Carpenter Technology Corporation . *2 Registered trademark of Isabellenhutte. What are electrical heating alloys? When electricity is applied to an object, the object emits heat. As the formula below shows, the higher the electrical resistance, the greater the amount of heat emitted. Heating alloys are a metal materials that have high electrical resistance and are used to produce heat. Excellent oxidation resistance and high-temperature strength. Use in sulfide gas, and in hot and humid reducing atmospheres should be avoided. Recommended for use in high temperatures. Has good oxidation resistance, but high-temperature strength is inferior to NCH. Resistance alloy with low resistance properties. Specification temperature is low, but workability and weldability are good. Ferritic stainless steel with excellent high-temperature oxidation resistance. Can be used as substitute grade for FCH-1 (to help reduce costs). Ferritic stainless steel with excellent high-temperature oxidation resistance. Can be used as substitute grade for FCH-2 (to help reduce costs). Can also be used in sulfide gas. In resistance alloys, variation in thickness affects resistance. We use the technologies that we have developed over the years to provide products with guaranteed high-precision thickness tolerance. We measure the conductor resistance of our resistance alloys using the thickness of products that will be delivered to you. *Be aware that it may not be possible to measure conductor resistance in some cases depending on product size. We guarantee the conductor resistance of our products upon request. Contact us for more information. *We can guarantee either thickness or conductor resistance. Depending on the material, we can guarantee temperature coefficient of resistance (TCR). We can adjust hardness to suit your requirements through a combination of cold rolling and heat treatment processes. In most cases we accept orders of resistance alloys in lots of 50 kg and up. *We are also happy to consider orders for prototypes and similar products in lots of less than 50 kg. Please contact us for more information. We respond to market needs for smaller and thinner products. We can adjust conductor resistance to suit your requirements. As shown below, conductor resistance changes—even for the same material—according to product dimensions (thickness and width) and product softness (thermal refining). By controlling these factors, we are able to achieve high-precision conductor resistance. • What is Volume resistivity? Volume resistivity is an intrinsic physical property of a material, and is measured in μΩ·m. It is affected by the compositional variation of each molten lot. • What is conductor resistance? Conductor resistance is the resistance per meter of rerolled product. It is measured in Ω/m. The amount of heat is determined by product dimensions (thickness and width), volume resistivity (ρ), and coefficient of resistance increase. Let us known the grade and dimensions you require and we will propose a solution for you.